​My project is a putt-putt course for the block party it took a little pit of time to plan then to actually make and design . The principles my group and I used was just cardboard of course for the putt-putt course and tape for mostly the taj maahal. 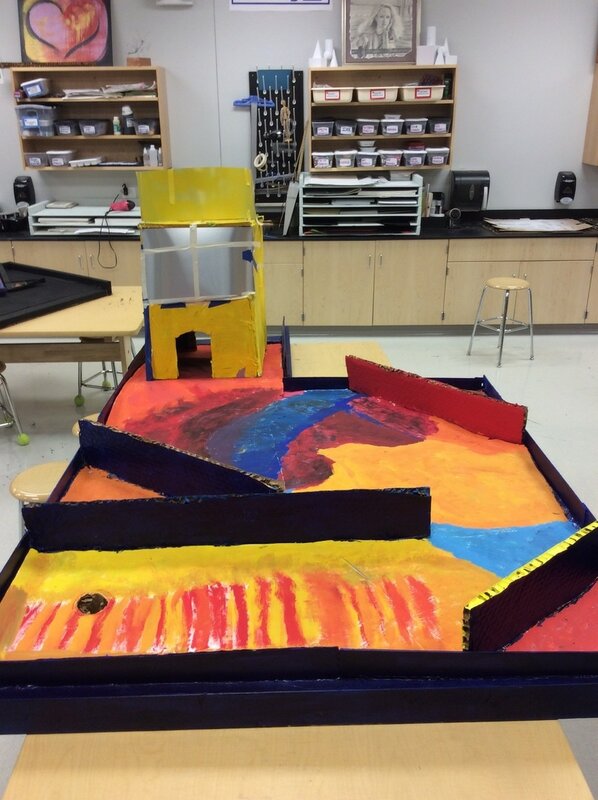 We also used wood to build the putt-putt course around and we used boxes to build inside the putt-putt course and large pieces of paper to glue on and paint over.My goals as an artist was to make something that I enjoy doing even if it takes me hours or even weeks to do. Plus I also I wanted to do something that would challenge me so I can test myself and make myself grow throughout the semester of my art class. ​My art work is a weaving of my favorite of a koala taking a nap but it’s taking a long time to do because I did a bigger version than usual. The principles I used was just string but to make my weaving and for my weaving box I had to use. Cardboard of course and tape then I used scissors to poke holes on the side so I can put my weaving strings through. Some tools I used was a sewing needle so I can go through easily throughout other strings. I also used tape to tape down the string that was in my way so I would not be confused when putting in the same color of string. My goals as an artist was to make something that I enjoy doing even if it takes me hours or even weeks to do. Plus I also I wanted to do something that would challenge me so I can test myself and make myself grow throughout the semester of my art class. I learned with weaving that it takes a long time to do even If you do a small weaving but if you work on it every single day and take time out to do it. It will be finished in no time. My art work looks is supposed to be a vase but it turn out as a pot which this looks perfect to me I did this because I love to make pots and vases and designing them. 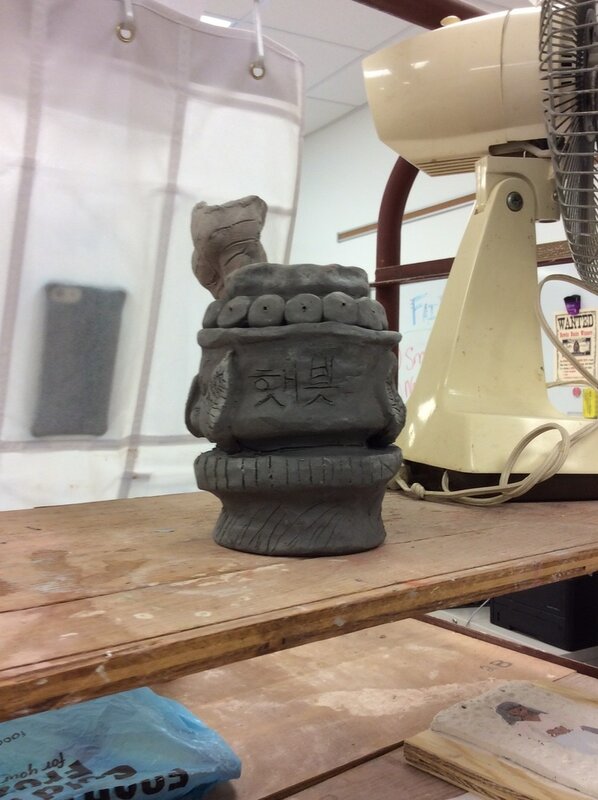 The principles I used was just clay but I also used water so I can coil it together and then smooth it out to make it more vase like. Some tools I used was a roller so I can roll out the clay to make it even so I could put it on my vase (pot). Pinterest inspired me because I went on there and I was like hey I want to work with clay and make a vase. My goals as artist is to make art out of my creativity and do something way different from other artist and use my imagination to make something very outstanding. I learn that if I take my time that everything would come out the way I wanted it to be and working with clay you have to be careful because if you come back to whatever your making and not cover it up the day before it will dry quickly and when you add new things to it with clay it will crack because it doesn’t have the same moisture. My final piece is not what I imagined it to be at all but I really love the way it came out. 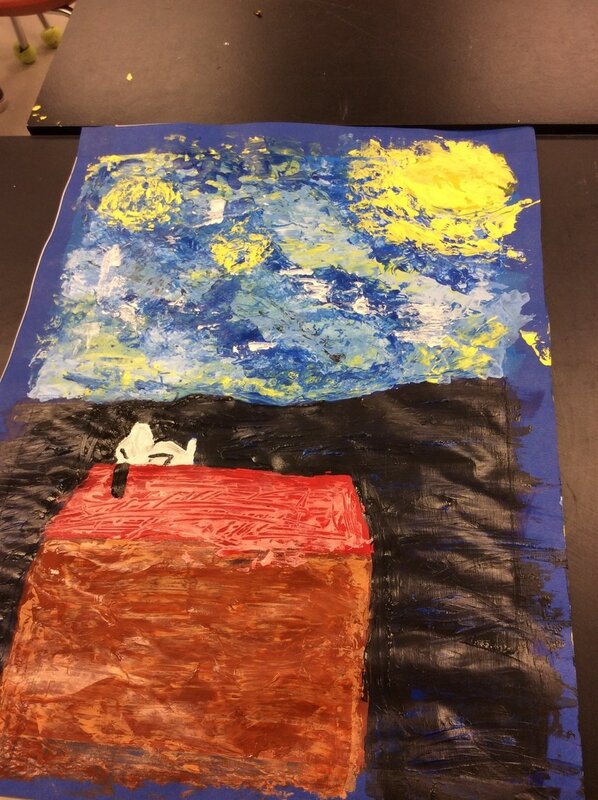 My art work looks like snoopy and the starry night of course I did this because I love snoopy he is my favorite animated animal. The principles I used was acrylic paint and some of this stuff that makes the acrylic paint have more volume so when you put it on paper you can put more layers on it so it can have texture to it. Some tools I used was just a scarper to make the paint spread and I used multiple paint brushes so I can mix colors together so I can have my light and dark colors. Vincent van Gogh inspired me with his famous artwork called “Starry night” and so I was thinking hey how about I put my favorite animated animal in it so I saw something on. 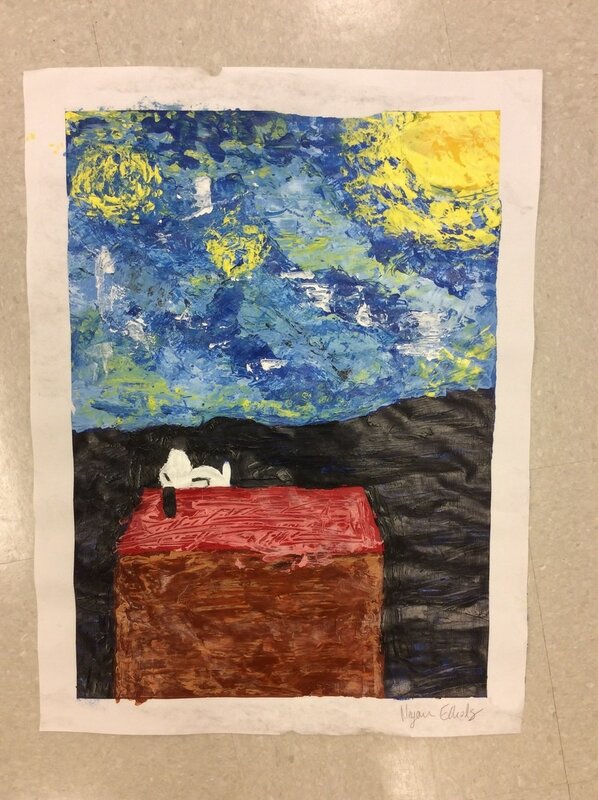 Pinterest that was exactly what I wanted and it was a starry night with snoopy in it. My goals as artist is to make art out of my creativity and do something way different from other artist and use my imagination to make something very outstanding. I learn that if I mix colors and make layers of paint on to an artwork that it makes your artwork stand out and bring texture to your artwork. My final piece is what I imagined it would look like and it’s perfect to me as it is because I love the texture and the different colors used in it. 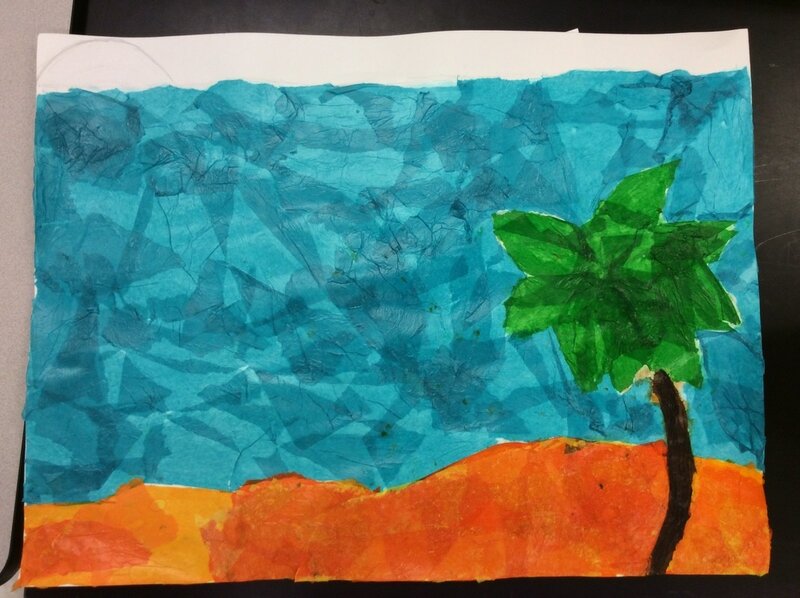 My Artwork is about the beach when I went to go visit jamaica I named this Jamaica Jamaica. The most that you will see in my project is that it’s made out of tissue paper mostly. The principles you see is the reflection of the sunset and how the color gets lighter the father it is away from the sun. Some tools, techniques or processes I used was mixing colors I really didn’t use any techniques besides planning how to get texture for the sand. I think Jamaica itself inspired me the most because it’s a beautiful place to be and you can’t leave without taking pictures and doing a art work on it. 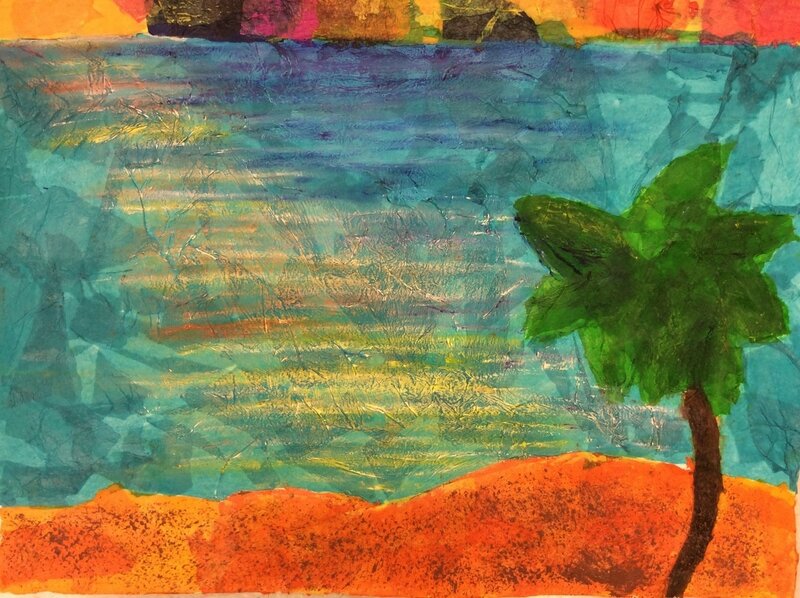 When I see my art I feel happy because it’s bright and colorful and cheerful it makes me actually want to go to the beach one day. My goals as an artist is to make mistakes and fix them without second guessing and my mistake turns into a well founded art piece. 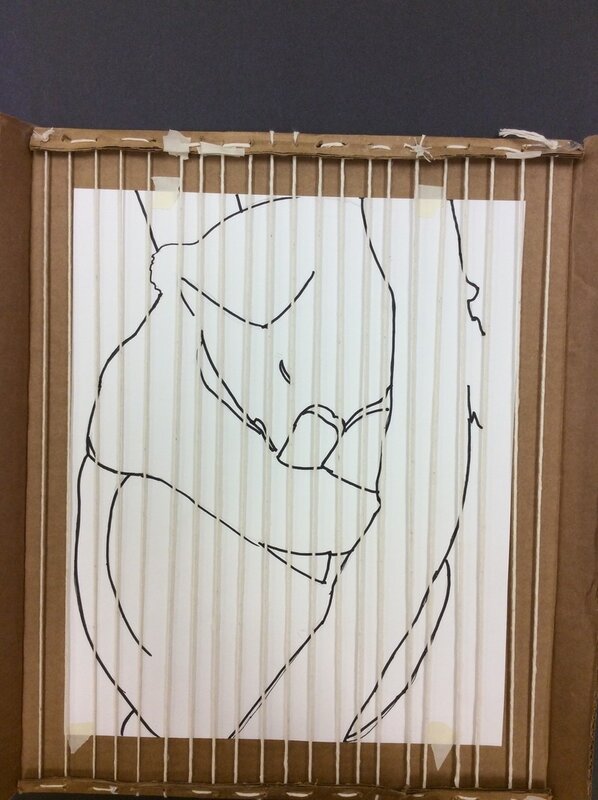 My thoughts on my artwork is I did learn something new and that was using tissue paper especially light colors open the eyes. 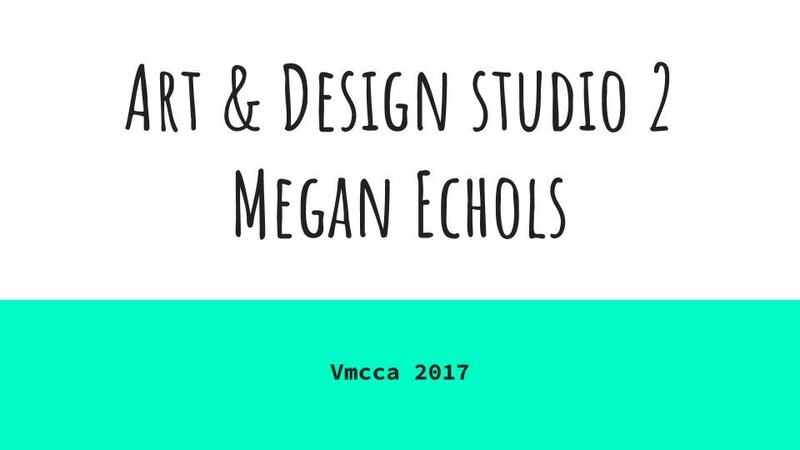 Hello my name is Megan E. I am 15 and a sophomore that attends Vernon Malone early college and is in Art 2 Design class.